Every year we use Christmas lights in the same way when the festive time is coming. We take them out of the boxes and string on the windows, porches and trees. Lots of tiny lights beautifully decorate our homes for a week or two and after we pack them carefully to wait for the next year. We repeat the same routine year after year. And make a decision to change something only when we see that our old Christmas lights have already died out. But this year everything should be different. Give way to your imagination and try various brilliant ideas for decorating your home with glittering lights. We can’t say exactly that they should be used in some certain ways. That depends on how much inventive person you are. Don’t be afraid to bring out to life some funny and odd ideas while decorating your house with Christmas lights. As a result, all your friends will be fascinated with magnificent look of your home. Think about your Christmas decorations in advance. For example, it is reasonable to buy the lights for the next year just after this Christmas as the prices will be really appealing. You can also use them as presents for guests who visited your party. In such way you will express your gratefulness to them. Christmas is a perfect time for gifts and surprises which you can make for your friends and family. If your friends are leaving for a few days before Christmas you can take this opportunity and decorate their homes with sparkling lights. On coming back your friends will be greatly impressed with the stunning look of their houses. We used to think that only our living room, front door and porch should be decorated for Christmas. I must admit that is absolutely wrong opinion. The festive atmosphere should be everywhere, even in your bathroom. This part of your home will look special and marvelous on this great day. So, make sure to choose some bright and beautiful lights and put them into your bathroom as a decoration. Everybody who comes into your bathroom and sees small lights around the sink and tub will admire their brilliant sparkle. Your creativity will be highly appreciated. Usually when we decorate our homes and yards for Christmas we pay much attention to everything that is overhead but we almost don’t put lights under our feet. I have some new and amazing idea! We can use our Christmas lights in a different way, not like we do every year. Choose plenty of tiny glowing lights and put them on your driveway. You can be sure that all your guests will keep their eyes on this gorgeous decoration. This is an excellent way to welcome your friends to a cosy house for unforgettable celebration. Surely, Christmas is a time of merriment, joy and fun. It’s a great opportunity for you to remember your childhood and play some games. There is a big variety of entertainments which you can try with Christmas lights. For example, take a long string of the lights and tie them badly. Suggest your friends to untangle them. The one who is a winner can take the strand of lights as a prize. At such magic period of the year as Christmas, everything and everybody should represent the festive and fantastic atmosphere. Our pets are not an exception. You can make a smart collar with lights for your dog. The only problem is that your pet can mix it up with a treat. You should be careful with them. For some people this idea can seem really crazy. But I think that Christmas is the right time for fun and madness. Simply relax and be yourself. Add a few lights to your festive clothes and definitely you’ll be in the spotlight this night. My only recommendation for you is to be careful with all the details. Make sure that you can move easily during the celebration. Colorful Christmas lights will look perfectly on your car. While preparing for the holiday, don’t forget to use some lights as a decoration for your car. They can be set outside as well as inside the car. With such adornment your car will capture the attention of all the people in your neighborhood. 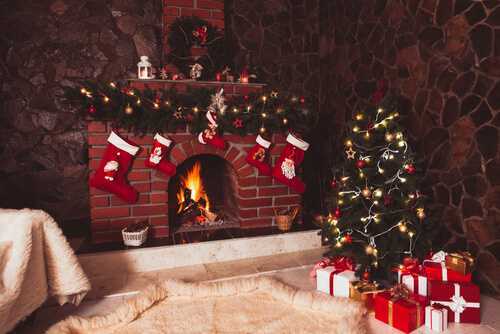 You can see that Christmas decoration of your home is almost impossible without lots of sparkling lights. You can use a great number of fancy ideas to represent the Christmas spirit for all your friends and relatives who visit your house during the holiday season. Moreover, your house can be decorated with the lights even when the holiday is over.